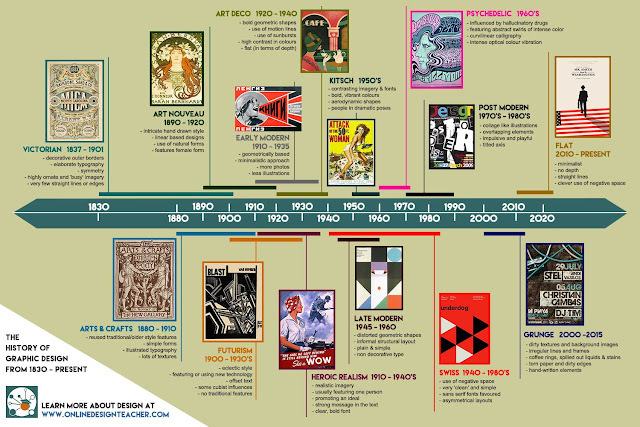 The Graphic Design Timeline above ranges from 1830 to the Present Day and outlines 14 different styles throughout the history of graphic design. It is important to note that not every graphic design style is included (there are lots) but all the important and seminal periods of graphic design are touched upon. Click on the timeline to view it full screen. At the start of any graphic design project I'm sure you have found yourself wondering what style should I choose? what style do I like? what style will look good for that project? what style can I accomplish with my level of skills? This timeline is designed to be a quick overview guide to help you decide but if you can click on the link to read more about the different graphic design styles and graphic design history .